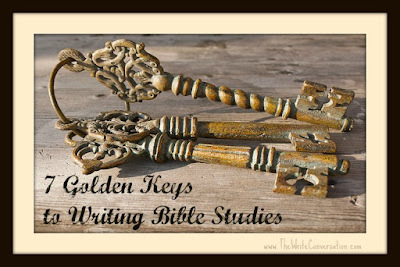 Here are seven golden keys to writing Bible studies that stir both the heart and the mind. Spend some time with the Author of the Book. If God has called you to write for Him, He knows exactly what messages and topics He wants you to share with the world. When we have God’s calling to write, His direction to follow, and His grace to depend on as we write, we will have the wisdom, confidence, and endurance we need to see the project through to the end. Develop your writing skill and voice. 2. Develop your writing skill and voice. If you’re new to writing, take some time to develop the craft (and never stop growing). Read great books on writing, attend conferences, and take classes. Bible study writers especially need to be excellent in their writing skill because what we’re writing about is so precious and life-changing. Write some devotions, and enter them in a contest. Start a blog. Start small, and dream big. As you write, develop your voice. 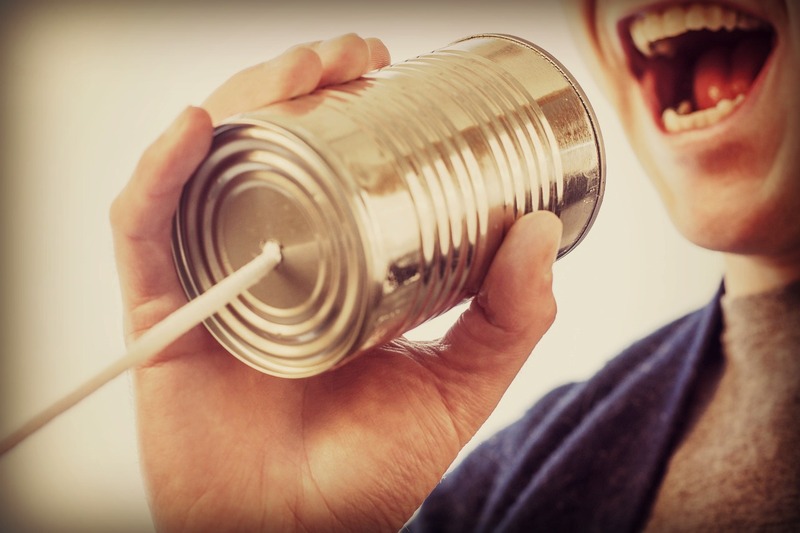 Writing isn’t just technical rules—it’s conversation. Write as if you’re having a conversation with a friend. What kind of voice, or tone, would you have with them? Make a friend out of your reader by sounding encouraging and uplifting. 3. Remember who you’re writing to and why. Identify your target audience, and write your Bible study with them in mind. Are they younger or older? What struggles are associated with their season of life? Are they familiar with Scripture or new to the Christian life? What is your purpose in writing to them—to encourage, instruct, give hope, explain Scripture, etc.? As you put black words on a white page, remember that your audience is colorful, alive, and human. 4. Know your topic from the inside out. When we write about something we have lived through, we are witnesses to the pain, struggle, victory, and joy related to that topic. We have ached with loss, struggled with sanity while raising our kids, winced at Satan’s painful arrows, or stumbled in trusting God. We saw Him heal our hearts, give us grace and endurance, become our protection, or strengthen our faith. When God pinpoints what to write about, talk about it from the inside out, not as a spectator looking in. Check out my previous post called Writing from the Inside Out for more insight on how to write like you know what you’re talking about. Take the time to understand your Scripture. 5. Take the time to understand your Scripture. Although we can present Scripture from a particular angle or slant, the heart of any Bible study should be understanding and applying God’s Word to daily life. Take whatever time is needed to study Scripture with its Author. Use helpful resources such as Bible dictionaries and commentaries as needed. We may not learn the definition of every word or know how to answer every question that a reader might have. But we can study enough till we have an accurate understanding of the book or passages we are writing about, and come away with a peace that we have studied enough. The power to change lives is found in the Word, and by God’s grace, we are stewards of that Word. 6. Pair truth with stories and illustrations. God loves stories. From Genesis to Revelation, the Bible is filled with story after story illustrating the goodness and love of God, the need of mankind for redemption, the saving work of Christ, and the oneness and courage God wants believers to have. We learn by stories. Choose memorable stories and illustrations that will help readers to remember your application and live it out. If you need some ideas for this, check out my previous post, For Non-fiction Authors: Tips for Choosing the Right Story. 7. Make your Bible study as interactive as possible. Ask questions. Supply cross-references for your readers to look up. Give prayer guides. Start a Facebook page for your book, and invite readers to discuss topics on it. Incorporate as many small group activities as you can into your book, either for an individual to contemplate or do, or for a small group to use. The more involved the readers feel, the more they will remember. 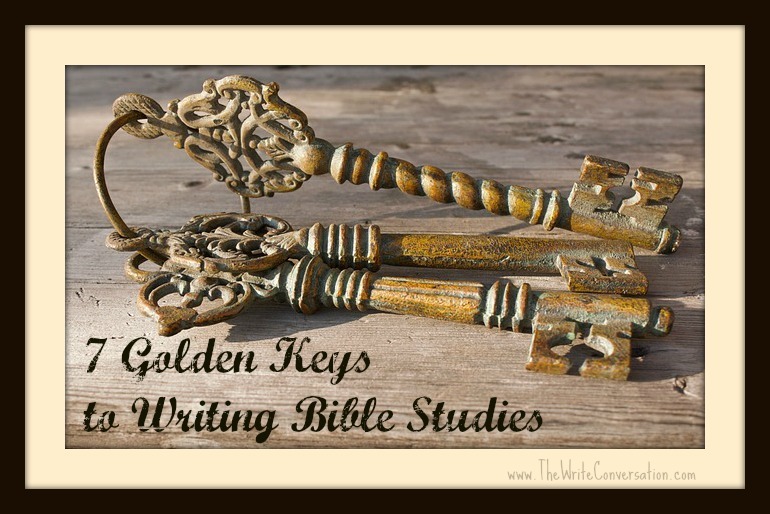 Which of the 7 keys above would be the most important to you in buying a Bible study for yourself? Which one do you need to focus on the most as you write? Don’t forget to join the conversation! Katy, this post was very helpful to me. I'm writing my book which is a Christian living book but can also be used as a Bible study. You confirmed what God has been telling me Bible truths with stories. Also, to write like I'm having a conversation. Thank you so much my friend. Cherrilynn, I enjoy reading the stories and devotions on your blog, so I look forward to seeing what you put in your book. I wish you God's blessings on your project, and thanks for your comment today! Katy, great post and very helpful. I hadn't thought about having a Facebook page for the book to encourage interaction. Great advice! Thank you! I'm glad you found it helpful, Crickett. Thank you for saying so, and with so many ladies on Facebook now, we have to take advantage of all the tools we have to promote and encourage Bible study! Let me know if you start a page! I'd want to discuss on it. Katy, your post is just what I needed. I recently completed writing a Bible study and am now in the process of leading a group of ladies through it sort of as a pilot group. The feedback I've received from them lines up well with your suggestions. One thing they have not mentioned is a Facebook page but that sounds like a great idea. I'm looking forward to hearing more from you! Thank you so much, Martha! I love the process of trying a Bible study out on a willing group. I pray God blesses your small group time, and please share insights with us as you and the group come up with them! Katy, Thank you for this wonderful post with awesome insights. I am getting real close to publishing the book Reaching The Mountain Top, it is based on Isaiah 40:31. It isn't a Bible study per-say but it could be used in a Bible study group. Everyday when I would sit down to work on it I would lay my hand upon the manuscript, (yes I still use paper/pen) and I would pray for God's guidance for the book to be pleasing to Him. Since it is pretty much complete I decided to think about your 7 keys in relation to this book and I have to say I think I came pretty close to being on target with your thoughts. I really enjoyed this post and I plan to print it off to keep as a reminder for future writing. THANKS so much for sharing your wisdom. Carol, thank you for sharing about your book. May God bless it as you seek to encourage others with that powerful verse. I clicked on your name and found your blog, and I think we should connect on Facebook. I have an author page too, and I hope to find all your pages. I saw that you're a craft-loving person, and my mom (who also writes) and I use scrapbook cards when we teach our Bible studies. So maybe you and I can talk about how that creative outlet can be used in Bible studies. Thank you for your comments and for reading the post. I'm so glad you want to use them as guidelines. God bless your writing! Thanks for the great tips. Each one is a topic in itself and so informative and thought provoking. I need to read them over and over again and will be referring back to these insights. Great! I'm so glad. Thank you, Barbara! May God bless your books.